Don’t We Need Each Other? As I have said many times in these blog thoughts, we Canadians live in a strange culture. In some ways I suppose this strangeness comes from how this great country of ours rose from what Lord Durham called “a few acres of snow” to become some of the most significant few acres of snow on the earth. In its earliest days as an Old World colonization spot, Canada was a magnet for a certain kind of person – the kind of person who wanted to be far from other people. These fresh air and freedom-seeking voyageurs, coureurs de bois, pioneers, explorers, entrepreneurs and adventurers roamed the land from sea to sea, filling the country with an independent spirit that in many ways has defined our national identity, and leaving a social legacy that has not always been beneficial. Independence has its good points. That kind of “pull yourself up by your own bootstraps and stand on your own two feet” attitude produces admirable results in times when we find that all we can rely on is ourselves. But an independent spirit gets us nowhere when we need to work together to get something done – which is most of the time. That’s when the value of interdependence is felt – the truth that we need each other to move forward. The importance of interdependence has its application in the family and the community, even the nation. But nowhere is interdependence more critical than in the Church. The Bible compares the Church to a body, emphasizing that it is a body made up of many parts, but that those parts need each other in order to grow and to be built up in love. The parts need to cultivate connection and work together in order to fulfill the mission of the whole body, which can only be accomplished in a practical atmosphere of interdependence. Now, most of us know what Jesus prayed as recorded in John 17:20-21: “My prayer is not for them alone. I pray also for those who will believe in me through their message, that all of them may be one…”, and most of us are familiar with what Paul said in 1 Corinthians 12:27: “Now you are the body of Christ, and each one of you is part of it”, so interdependence in a local congregation and between local congregations isn’t a new idea. But at the same time we tend to run our Churches like restaurants, trying to grab “customers” from the Church down the street, or like fortresses – independent little citadels bent on protecting ourselves from the world and from other Churches. In the process of trying to promote our own selves, we are missing Jesus’ bigger purpose for the Church – to be His Body, joined and held together by every supporting ligament. I believe that the Lord is having the Church focus on this important principle in order to move His Kingdom forward in the significant ways it needs to in these days. Being the biggest, funnest, busiest, most attractive local Church on the block or in the city just doesn’t cut it any more. We are called to work TOGETHER, to SHARE resources, to SUPPORT one another – to really be the Body of Christ. And while the idea isn’t new, the practice seems to be. We just aren’t too good at it. 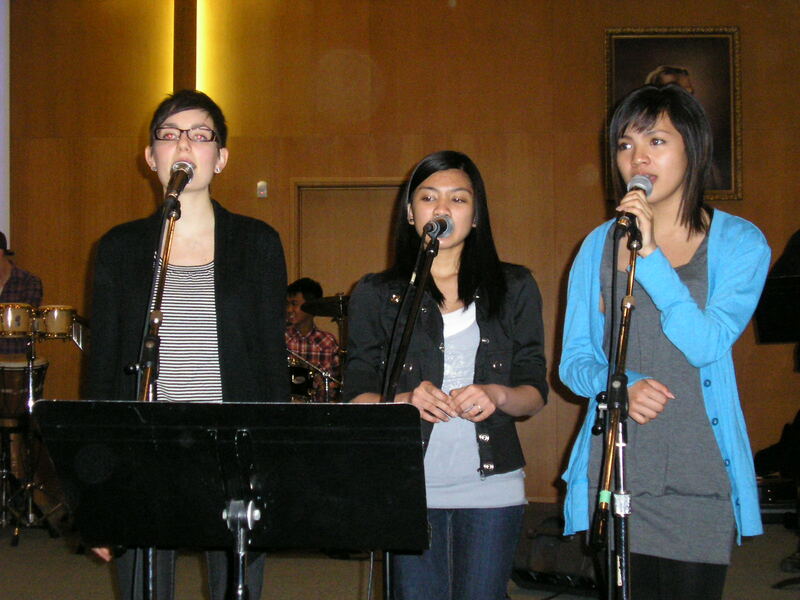 So to do our small part to contribute to the reality of the Body of Christ in the city, we had a Praise Party. 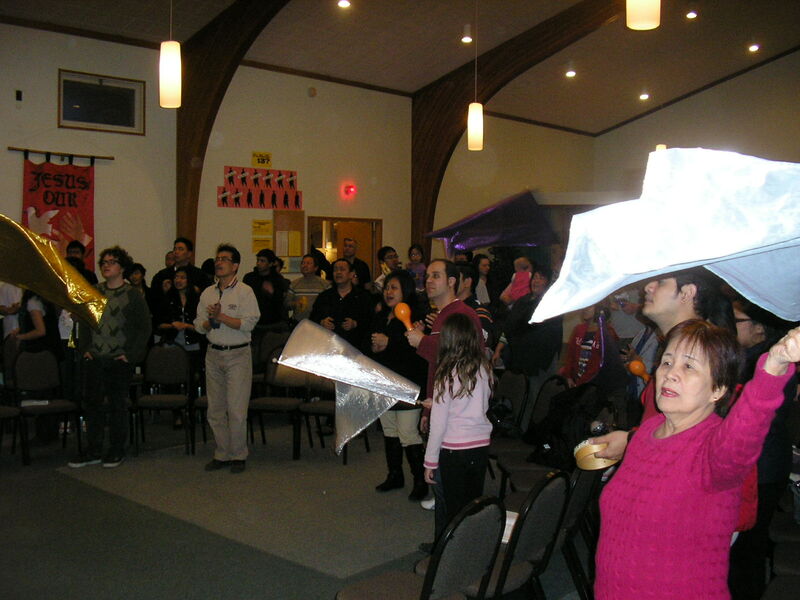 LivingStones, FireLight and Heartland (a Filipino Church we are connected to) got together to worship the Lord with music and food – two universal languages that are helpful in efforts like this. We even mixed up our worship teams, getting musicians from all the fellowships to work together to provide the musical part of the evening. It was great! About a hundred of us met on Saturday, March 20th for the Praise Party. I welcomed the people, then Pastor Rod Lantin from Heartland gave a devotional about unity. From there the musicians led the people in worship. Between musical sets, Pastor George from LivingStones got people into inter-Church groups to pray for one another. At the end of the evening, we all went downstairs to break bread and chips and spring rolls. And I think we went home liking the Lord and each other a little more. It wasn’t some great inter-Church foray into the world to save thousands of souls, but it was a start. We gathered around the throne of God together, agreed with His heart that we would get along as the Church, and had warm fellowship with each other. I think stuff like that shakes the gates of hell. And it also sets the stage for more interdependent, cooperative projects that the Lord has for His Body, the Church. It seems clear that the Lord has much for us to do in this city – more than any one local fellowship can handle by itself. But will we turn from our independent, parochial paradigm, lock arms with the rest of the Church and go for it?